I knew going into The Quiet Man that it wasn't going to be a good game, but I was absolutely shocked by how terrible it truly was. What should have been a mediocre FMV game about a deaf person turned out to be one of the most pretentious and confused piles of bad decisions I have born witness too. And, if you're so inclined, you are welcome to join me on this adventure into The Quiet Man. And yes, for all my trouble playing The Quiet Man, my reward was for it to freeze just before I unlocked the ability to play it again with audio and the trophy for completing the game. It's honestly hard to understand exactly what happened behind the scenes to turn whatever idea spawned this game into such a bad experience. It seems hell bent on making sure that the player is left as confused as humanly possible. Part of that comes from the game's most infamous design choices: To remove audio from most of the game. Verbal/word-based communication is only one way to convey thoughts and ideas to other people. With this in mind, a good script writer/director would take advantage of those other ways (expressions, costuming, body movement/positioning) to clearly signal the big events of the story to the audience. But The Quiet Man doesn't do that. Instead, they spend their time on long stretches of shot/reverse-shot dialogue scenes where people are just speaking to each other. This is pointless in a game without audio, because we can't hear what any person is saying, and their aren't enough non-verbal queues to understand the conversation. This would be a fascinating choice if it was meant to help us sympathize more with protagonist Dane, who is (allegedly) deaf or hard-of-hearing, but that can't be true. If the lack of audio was supposed to draw us into Dane's viewpoint, then we would have subtitles when he can understand what other characters are saying with words or ASL. This is clearly not the case, as there are plainly times where Dane isn't just understanding what is going on, but actively responding back. And since there's no audio or subtitles, the player is left in the dark with regards to what their own character is doing. This ambiguity extends to the combat. I got the basics down, with light/heavy attacks, grabs, and dodges. But when it comes to the finer details, like counter attacks, parry windows, "focus meter", and guard breaks, it was impossible for me to figure out what was going on for most of the game. I didn't even realize the game had counter attacks until the one boss where I had to learn how to do it, over 3/4 of the way through the game. There's no real way around it. This game is bad, shockingly so. 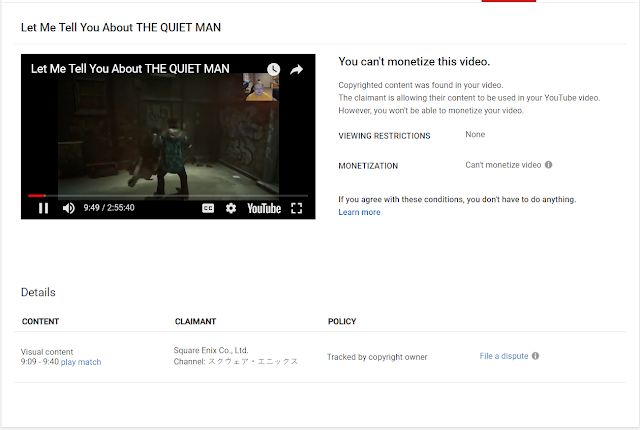 Square Enix issued a copyright claim. If you're having issues viewing the stream, that would be why. Hitman 2 - Elusive Target 1 - Sean Bean Dies!